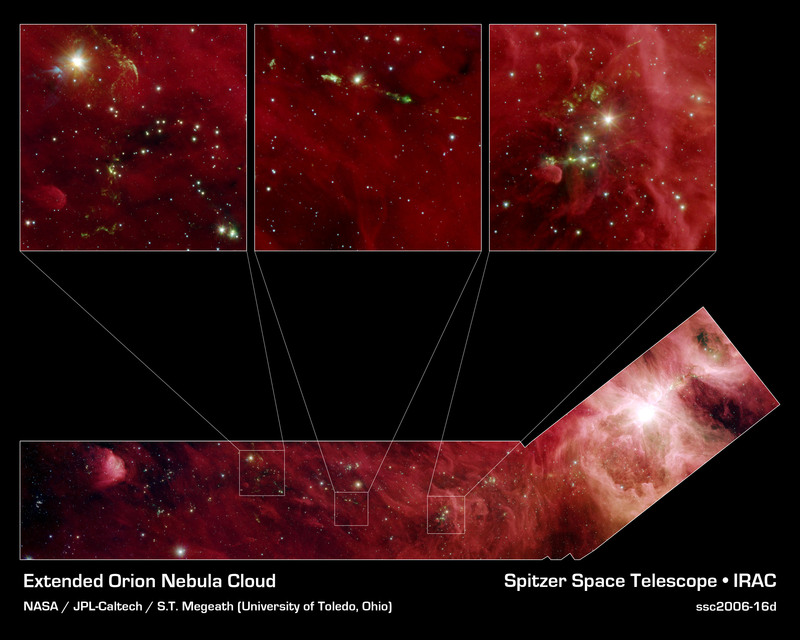 This image composite shows a part of the Orion constellation surveyed by NASA's Spitzer Space Telescope. 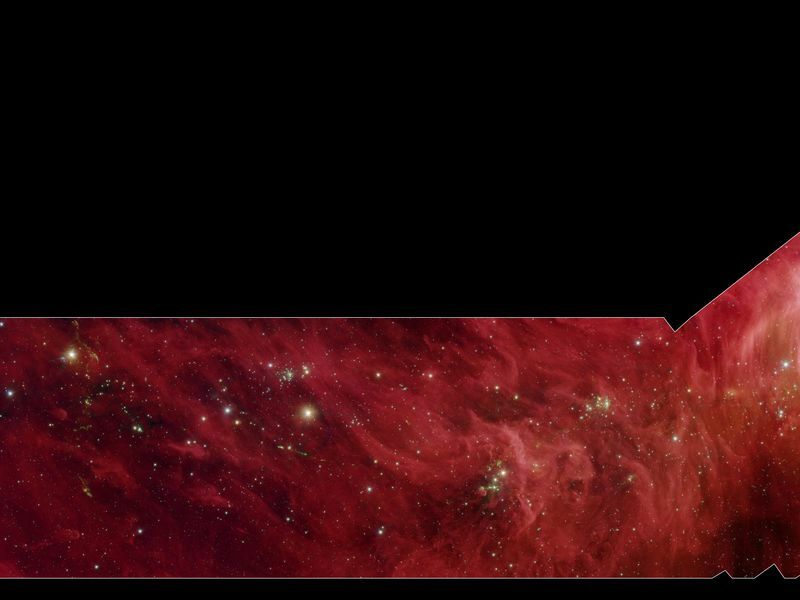 The shape of the main image was designed by astronomers to roughly follow the shape of Orion cloud A, an enormous star-making factory containing about 1,800 young stars. This giant cloud includes the famous Orion nebula (bright circular area in "blade" part of hockey stick-shaped box at the bottom), which is visible to the naked eye on a clear, dark night as a fuzzy star in the hunter constellation's sword. 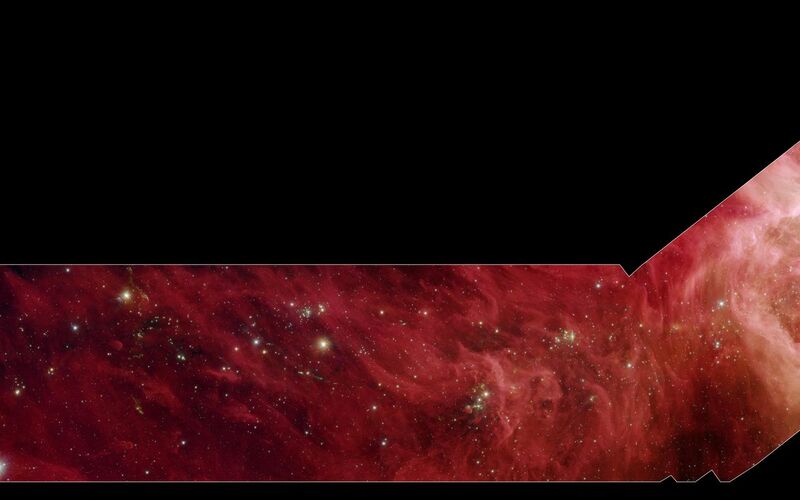 The region that makes up the shaft part of the hockey stick box stretches 70 light-years beyond the Orion nebula. This particular area does not contain massive young stars like those of the Orion nebula, but is filled with 800 stars about the same mass as the sun. These sun-like stars don't live in big "cities," or clusters, of stars like the one in the Orion nebula; instead, they can be found in small clusters (right inset), or in relative isolation (middle insert). In the right inset, developing stars are illuminating the dusty cloud, creating small wisps that appear greenish. The stars also power speedy jets of gas (also green), which glow as the jets ram into the cloudy material. Since infrared light can penetrate through dust, we see not only stars within the cloud, but thousands of stars many light-years behind it, which just happen to be in the picture like unwanted bystanders. Astronomers carefully separate the young stars in the Orion cloud complex from the bystanders by looking for their telltale infrared glow. The infrared image shows light captured by Spitzer's infrared array camera. Light with wavelengths of 8 and 5.8 microns (red and orange) comes mainly from dust that has been heated by starlight. Light of 4.5 microns (green) shows hot gas and dust; and light of 3.6 microns (blue) is from starlight.